Most every kid had that harsh reality check in childhood when they saw a big fluffy roll of fiberglass insulation and had visions of cotton candy and pink pillows and a soft, plush pad to play on. Most parents probably strictly instilled a no-touching policy before the danger was experienced, but some curious kids may have still run their hands across the fiberglass insulation, vowing after to never disobey again! What a disappointment that something so fluffy could be so dangerous! One of the real problems with rolled batt fiberglass insulation is that it seems relatively easy to install yourself, so many people try to take on the project with a “how hard could it be” mentality. The difficulty of the installation should not be the only concern, but also, if it is a safe project for an inexperienced person to undertake. There are some real risks with fiberglass insulation, and not all of these are even understood yet. Small particles of fiberglass insulation that come in contact with your skin can get stuck in pores and cause a major rash or irritation. These particles are also capable of getting lodged in your lungs, causing a number of different respiratory ailments, with long-term effects still not being fully understood. Because these long-term effects are unknown, OSHA requires a cancer label to be put on fiberglass insulation packaging. Installing the insulation may not actually be as easy as it looks, especially if you are trying to do it safely and efficiently. 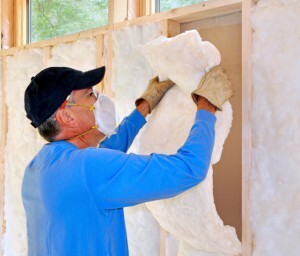 At Polk County Insulation, we offer affordable fiberglass insulation installation, done by professionals who will take the proper precautions to protect themselves, but also your home and the air you breathe. If you were thinking of installing fiberglass insulation yourself, please consider instead calling us at Polk County Insulation.